A derailment at Upper Sandusky, Oct. 23, 1897. Photo from the Edward H. Miller Collection. The consolidation of the three railroads into one company on August 20, 1881, came as the culmination of a scheme planned and executed by Stevenson Burke, a promoter from Cleveland, and several associates. This particular scheme involved raising the money to purchase the stock of the three railroads and retaining stock ownership of the new consolidated company, which purchased certain coal lands at an exorbitant price. Reduced to its simplest terms, the scheme involved a contract between Burke and Greene (president of the C&HV, the C&T and the O&WV) stipulating that Burke and his associates would purchase the stock of the three companies, provided the companies would advance them the necessary funds. A bond issue totaling $14.5 million provided $6.5 million to meet a like amount of the outstanding bonds of the three companies, $6.411 million to pay the individual notes of Burke and associates, with the remaining $1.589 million going to Burke, Greene and associates. The Burke group went on to bigger and better things by declaring themselves a 13+ percent dividend, trading 80 acres of land near Toledo to the Toledo and Ohio Central for $3.525 million of the bankrupt road's bonds, exchanging one share of CHV&T stock for two shares of T&OC stock and then selling the CHV&T stock. 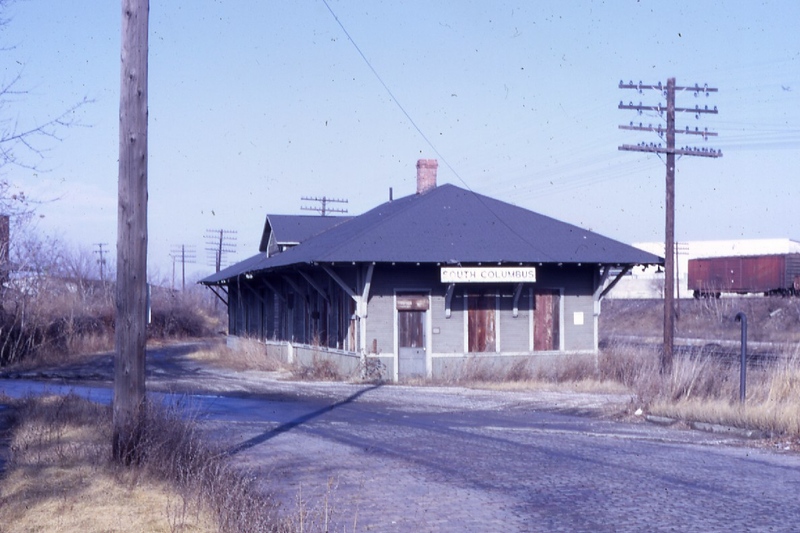 The South Columbus Hocking Valley Depot, February 1969. Photo from the Edward H. Miller Collection. 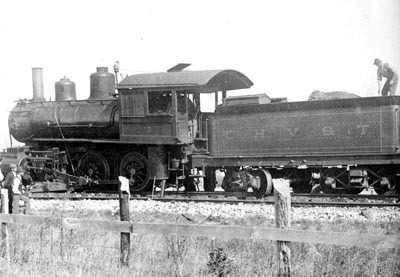 The Columbus, Hocking Valley and Toledo took delivery of a somewhat orderly group of 10 locomotives in 1881 and 14 in 1882. 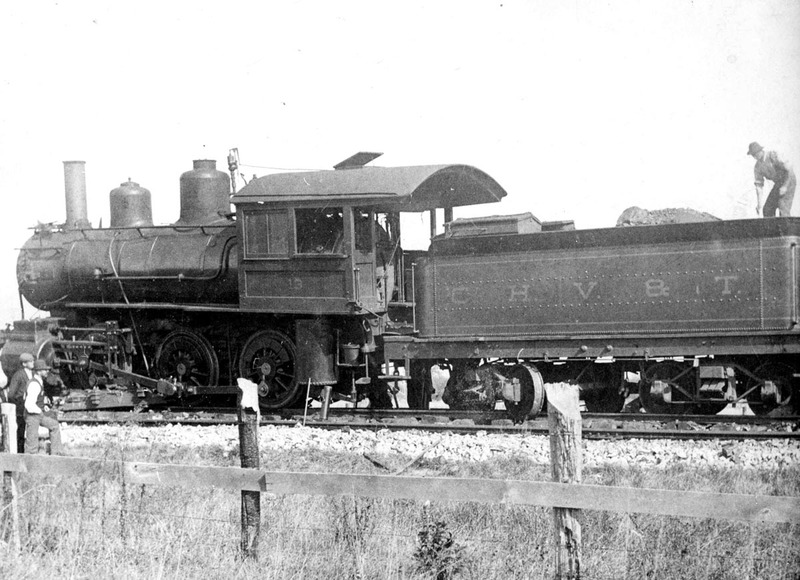 There were 16 4-4-0's, two 0-4-2T's and eight 0-4-0's. The first six came from Brooks and the other 18 from Rogers. Within a short time they carried numbers 59 to 70 and 79 to 90. Many coal miners went on strike in June 1884, but the strike was not universal. A small group of men entered a mine near New Straitsville and set a fire in an effort to stop strike breakers. Resisting all efforts to extinguish it, the smoldering fire consumed more and more of the 14-foot thick vein, burning uncontrolled into the 1930's and destroying millions of dollars worth of the black gold. The new owners of the Columbus, Hocking Valley and Toledo instituted a lawsuit against Burke and associates that dragged through various courts for nearly a decade and was settled by arbitration in favor of the defendants.